They are called mezzelune, litterally half moons. Yes, if I didn't call them ravioli, I would have totally called them mezzelune. Maybe Hav-Ravs? What does dried sage taste like? lol around the outside was great! so funny I rewinded and rewatched! So very very good! And easy but we don't have to tell my hubby that right? He was SO impressed with me, hee. My eight year old loved them as well. Thank you Chef John for another winner :). John, you should sell a "Chef John's Freakishly Small Wooden Spoon". I think it would be a big hit. Just sayin. These are *amazing*! The mascarpone makes it taste nice and rich, and the squash flavor come through. Everyone loved these. You may want to try using fresh marjoram leaves instead of sage. Marjoram has a bright, astringency that won't sucker-punch you in the mouth like sage. 1. WOW! these look great! I'm definitely going to try 'em! 2. did you really just reference an eminem song?!? :) hehe!! that was too funny! 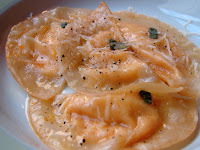 I had some great butternut squash ravioli the other day at a restaurant, so I came online and search for recipes. You have no idea how glad I found out foodwishes had this, because I trust every recipe you post Chef John! Making these tonight, thank you!!! Can you suggest a different cheese that might make this more of an entree? Thanks.